In an effort to curb gun violence, Hempstead kids were recently given the chance to trade in toy guns in exchange for safer play options. Kennedy Memorial Park in Hempstead recently hosted the New York Toy Gun Exchange Program, an initiative intended to teach kids that guns are, in fact, not toys. With gun violence dominating the headlines more than ever in recent months, the need felt by many to crack down on the senselessness of it all is stronger than ever. One woman is leading the charge to affect change where it’s needed most–with children growing up in the middle of the violence–and she’s found a very effective means of doing so. 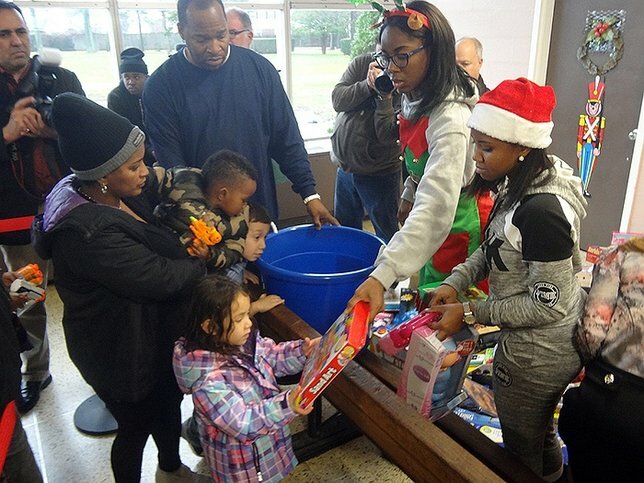 On December 23, Kennedy Memorial Park in Hempstead hosted a unique initiative new to the area-the New York Toy Gun Exchange Program, which gives kids the opportunity to trade in toy pistols and rifles and receive sporting goods, educational items, and safe toys in return. New York Toy Gun Exchange Program founder and philanthropist, Jean Shafiroff, provided a pile of over 500 toys, all paid for right out of her very own pocket. Among them were dolls, puzzles, action figures, and more, and all of them for the taking for any child willing to give up a toy gun in exchange, while hopefully learning a valuable life lesson as well, she said. Hempstead is no stranger to gun violence; earlier this year, 12-year-old Dejah Joyner was shot in the head by a stray bullet fired at her home, sparking outrage amongst a community growing all-too-used to such horrific occurrences. Recently, a local street has been named in Dejah’s honor; a dubious honor that Shafiroff said she hopes never has to be done for another child again. Hempstead Board of Education President Lamont Johnson said that guns are ingrained into American culture, and in order to break that cycle, we must impart the knowledge of the danger that these weapons present to the next generation of youngsters. Another reason for getting toy guns out of the hands of children, Johnson said, was to prevent them from being mistaken for the real thing by police; according to the Attorney General's office, since 1994 there have been 63 shootings linked to toy guns in New York, eight of which ended up being fatal. “We don’t want a law enforcement officer to see a child with a gun that appears to be real, and the result is a tragedy,” he said. Their efforts to that noble end certainly seemed to be successful on that day; scores of excited kids lined up at the Kennedy Memorial Park’s recreation center, all wielding a variety of colorful plastic guns that they were happy to pitch into a bucket in favor of a brand-new present devoid of any violent underpinnings. Soon the bucket was overflowing with discarded toy weapons, and their previous owners seemingly much happier with their new, less dangerous wares. Maria Sanchez is a mother of two, and came to that day’s toy gun exchange in order to send a message about safety within their community, and to her kids, the fact that they could trade in their old plastic pistols for some sweet new sporting equipment was just icing on the cake. Lawanda Jones brought her six year-old son, Samuel, to the Toy Gun Exchange, and the lad seemed quite happy to unload his plastic Nerf shotgun in favor of Superhero action figures. Subject: LongIsland.com - Your Name sent you Article details of "Hempstead Village Hosts Toy Gun Exchange Event"